The Euro was introduced on January 1, 2002. 14 billion Euro banknotes and 55 billion coins were initially introduced to more than 300 million people in 12 countries of the European Union. Austria, Belgium, Finland, France, Germany, Greece, Ireland, Italy, Luxembourg, Netherlands Spain and Portugal, & Monaco. Euro was introduced. 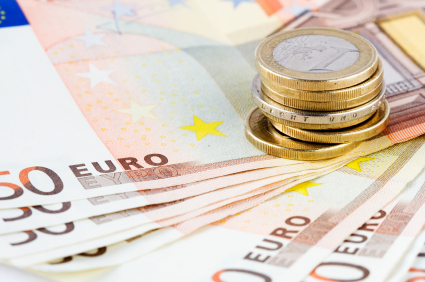 Today the Euro is the currency for approximately 300 million people spread across 17 EU countries. The Euro has a “common” side of the bill across all the countries and each country prints its own national emblem on the other side. ATM’s are scattered throughout large and small towns in all of Europe, both in Eastern and Western Europe. The major difference between ATM’s in Eastern versus Western Europe is that the ATM’s in Eastern Europe sometimes have problems accepting ATM cards from North America. Western European ATM’s accept the major symbols such as Cirrus, Star, Plus, and Explore. Luckily when I was in Eastern Europe I had enough foreign currency to exchange. ATM’s are a very easy way to get money for the most part. In Western Europe I found that I had about a 80% success rate on getting money from ATM’s. In other words 80% of the ATM’s I initially used actually worked. Sometimes I would have to try 2 or 3 ATM’s before I found one that would actually work. This isn’t a big problem in large cities or even good size towns, but is a big problem in the smaller towns or the country side. ALWAYS take out more local currency then you think you will need, ESPECIALLY if you know you are going to be in small towns or in the country. Time and time again on my initial European travels I would take out just what I thought I was going to use, and then time and time again I would have to waste time looking for another ATM in order to take out more money because of unforeseen circumstances. I did this because I was afraid to lose the small amount of money in the re-exchange rate. However, I forgot that I was paying a fee to use the ATM every time. Your bank may or may not charge you a small fee for using the ATM. These fees range from a dollar to several dollars. If you have PayPal get a PayPal debit card – often the cost of using an ATM with PayPal is less than what you will pay by using a major credit card. If you are going to be carrying cash, especially larger amounts of cash, a money belt is highly recommended for carrying your money. A money belt (preferably one that is water resistant) is an excellent way of securely carrying your money or other important documents. It is well hidden under your clothes and out of sight of potential thieves and pick pockets. A water resistant belt is always a good idea, especially if you are traveling in a hot climate in the summer time. I found that staying drenched with water during the day was a better way to stay cool instead of completely shedding upper body garments (at least for the male gender). The dampness would allow one to stay cool for up to an hour and was quite refreshing especially if there was a slight breeze. I perfected this technique in the 112 degree F heat of downtown Athens in mid July. One note is that there are water fountains, especially in the southern European countries such as Greece and Italy, running constantly. This makes drenching yourself much easier when you can easily find running water fountains. A money belt worn around your neck is not recommended. This is much easier to see then a money belt worn under your clothes. It can be easily removed from your neck either by quickly pulling it until it snaps, or quickly cutting it. Consider bringing travelers checks as a backup. Bring more then enough for emergencies. I brought only $200 for 6 weeks of travel, and I used them all up in the first week and a half! Most hotels and stores will take them. Denominations of $20 US are easiest to deal with. It is also a good idea to take some currency from your own country as backup. I took $500 hundred dollars US for 6 weeks, and I could have used another $500. If you take cash from the US take $20 dollar bills. They are easy to exchange. Sometimes banks will not exchange $100’s or even $50’s as they are afraid of counterfeiting – however sometimes you do get a better exchange rate for the larger bills. If you are taking large bills to convert to local currency try to get newer currency from your home country. Remember that larger bills are also harder to cash at small stores, restaurants, or other places. Unfortunately ATM’s usually give you large bills especially if you withdraw a large amount. I never had a big problem using the large bills to pay for something small, the large bills just raised a few eyebrows when the cashier had to give up almost all of her small bills in change! I found that southern Europe including much of Greece and Italy did not take credit cards in small establishments. This was true in a number of small hotels, restaurants and stores. It was much easier to use credit cards at most establishments in the rest of Europe. For the most part I stayed at decent, clean, comfortable hotels. I would leave my backpack in the hotel room. I would leave for most of the day and sightsee and then return in the late afternoon or evening. I never had anything stolen. Most of the time, you can leave some of your valuables (money, purchases) with the front desk. They will either have a small safe or a hidden away drawer that they can store your items for you. Some rooms even have safes with a key or combination. Some hotels/hostels may charge extra for the use of their safe. If you are really paranoid there are ways to cleverly hide your valuables in your room without losing them. First, you want to shy away from places that will be looked at or altered by the maid. Some of these “stay away from places” are bed sheets, pillow cases, towels, or mattresses. Some places you may want to consider hiding valuables are the inside seam of the bottom of curtains, and small non flammable items can be placed in and on a light bulb cover, especially if the light bulb cover is colored or non white. Other potential hiding areas are on the bottom drawer of pull out drawers, cracks at the bottom of closets, or in the back of pictures that are hanging on the walls. If you are in a “drop tile” situation (the ceiling is made up of drop tiles)- pick one of the drop tiles, push it up, and place some of your valuables above it – just be sure to collect it when you return. I’m sure you can think of some other nifty hiding places. Send me your ideas. There are foreign currency exchange offices located throughout the cities and small towns. Some will charge a small commission rate to exchange money and some will not. Sometimes motorcycle or bicycle rental companies keep your passport until you return their equipment. Other times hotels will hold on to your passport until you pay the hotel bill. Keep in mind that you need a passport to exchange travelers checks. It will do you little good if your passport is sitting in a hotel or equipment rental company far from where you are exchanging money. At the very least it will be a hassle to go back and get your passport, and try to explain to people, that you need it for exchanging money, especially if they do not speak English. Prices vary dramatically from country to country. The cheapest prices are in Eastern Europe, the next cheapest were in Greece and southern Italy. The most expensive prices were in northern Europe, and particularly in France, Austria, and Switzerland. Let me give you some examples. A normal can of soda in Greece or The Czech Republic would cost about $1.50 US, where in Switzerland or Paris a can of soda would be around $2.50 or $3.00 US dollars. Another example: renting a motor scooter for an entire day cost about $30 in Greece. Another example: a good sit down dinner for one in Prague (Czech Republic) was between $9 and $13. In Paris a decent sit down dinner would average around $20-30.